Creative Living award winners, Ann Smith and her mother Francine Kelly. 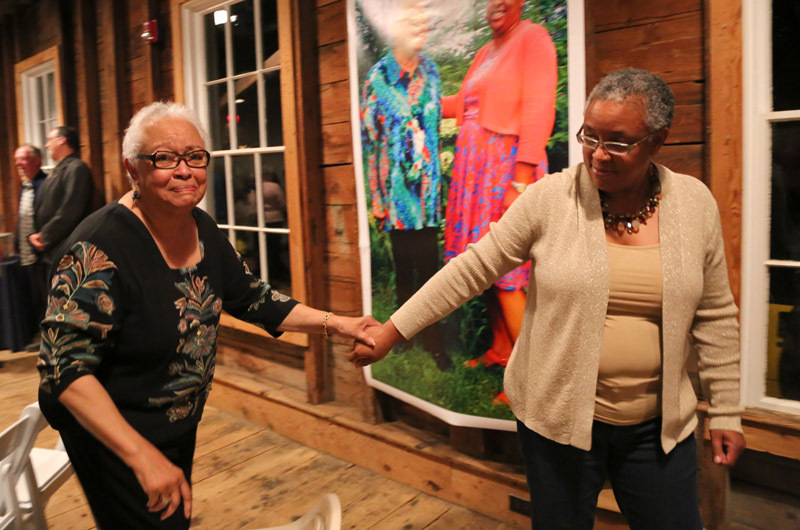 The Grange Hall was standing room only on Wednesday evening as the Island community and members of the Permanent Endowment Fund of Martha’s Vineyard celebrated the mother daughter duo of Francine Kelly and Ann Smith. The program featured speakers and music by the Featherstone Ukulele Fest. 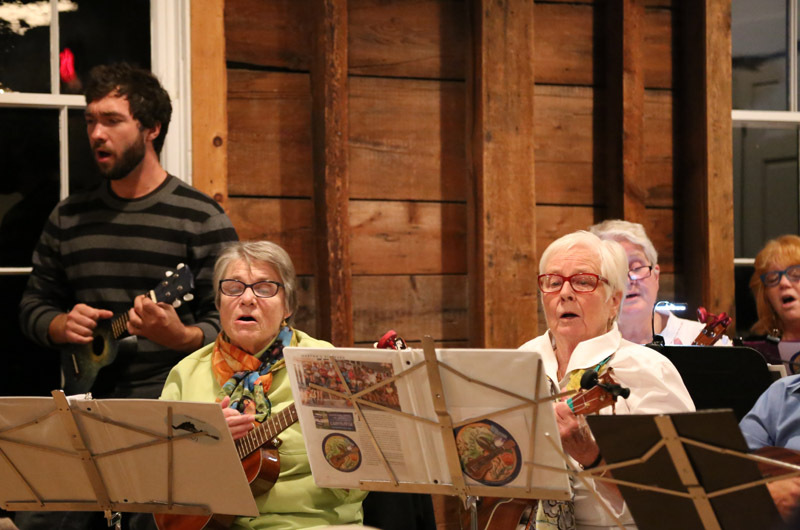 After the ukulele group played the women’s favorite songs: Somewhere Over the Rainbow and You Are My Sunshine, which the audience joined in singing, chamber of commerce executive director Nancy Gardella spoke about her two friends. “I was just thinking, only on Martha’s Vineyard could such a wonderful personalized ceremony such as this exist,” said Ms. Gardella. Board members Paul Karasik, Don Ogilvie and last year’s award recipient Steve Ewing presented Ms. Kelly and Ms. Smith with their awards. A standing ovation followed. In 2011, Ms. Smith succeeded her mother as executive director of Featherstone. “I’m often asked how do I do it everyday? And the answer is quite simply: loving what you do and doing what you love,” said Ms. Smith. Francine Kelly was the most welcoming person I met on my children's first day of school in Edgartown when I moved here. She welcomed me with an open heart and said to come on by Featherstone to share ideas. It was such a blessing to have this kind of artistic support from a place i had no history. Ann following in her mother's footsteps has been such a lucy coup for the Island art community. 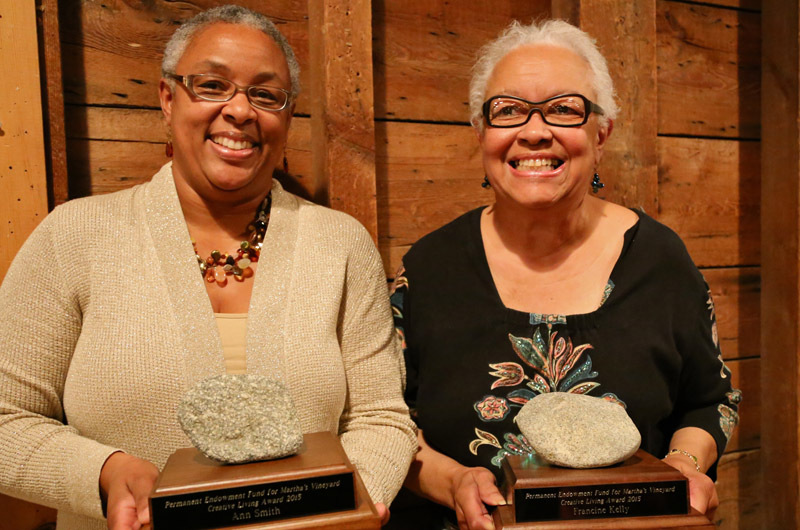 I am ever thankful to both these wise and wonderful women and Featherstone Center for the Arts! Congratulations to bothFrancine and Ann. Two powerhouse patrons of the arts, And shoulder-to -the-grindstone whirlwinds of get it done energy. And full of kindness and caring. Well chosen, committee. I was disappointed that the annual Jazz on the Vineyard was not held at Featherstone this past Summer 2015, it is a great venue and for a worthy cause. I do hope next year that it will be held on the grounds of Featherstone. It is the perfect setting for an outdoor Jazz concert since so many of us have contributed to the on going success of Featherstone. Hopefully, the director will work with the organizers in a positive manner for the Summer of 2016.